Although a model’s architectural elements may appear connected, the underlying topology might be fragmented, preventing proper analysis of structural behavior. Framing Repair is our solution to this problem, enabling our engineers to analyze and modify the topology of structural assemblies. 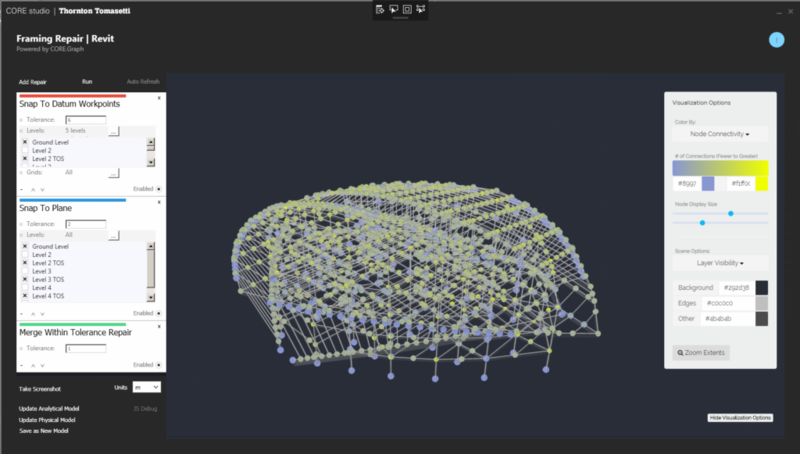 Framing Repair uses our proprietary graph library, SRep (Structural Representation), to perform repair operations, such as snapping elements together at predefined points, joining neighboring members within a tolerance and visualizing the connectivity degree/weight at each node of the structure. The built-in Spectacles viewer displays a visualization of the model so that the user can quickly detect and resolve connectivity issues.